Since I consider myself the world’s biggest advocate for tax competition and tax havens (even when it’s risky), I’m always on the lookout for new material to share. So I was delighted to see a new monograph from the London-based Institute of Economic Affairs on the benefits of “offshore” financial centers. Authored by Diego Zuluaga, it explains why low-tax jurisdictions are good news for those of us laboring in less-enlightened places. Offshore finance serves several purposes, the most salient of which is the efficient allocation of capital. Some of this activity is tax-related, aimed at raising after-tax investment returns. If it were not for offshore jurisdictions, much foreign investment would be vulnerable to double or triple taxation. Because, under such punitive rates of tax, some of this investment would not take place, the existence of offshore centres has real positive effects on economic activity alongside the (plausibly) negative impact on the tax revenue of individual countries. These welfare gains have been amply documented… Beyond their impact on aggregate investment, research shows that the existence of an OFC is associated with better economic outcomes in neighbouring countries. Contrary to the popular narrative, these jurisdictions are well-governed and peaceful. Who, after all, would wish to use intermediaries in places where investors were regularly expropriated or harassed? …It is difficult to imagine the process of globalisation that has taken place over the last fifty years, bringing hundreds of millions of people out of poverty, happening without the robust financial and legal framework which offshore jurisdictions provide for investment. It would be counterproductive, for both the developing and the rich world, to undermine their essential functions. …Clamping down on offshore centres…would make societies less productive and prosperous, and this effect would compound over time. He provides some fiscal history, including the fact that government used to be very small in the industrialized world (indeed, that’s one of the big reasons why today’s rich nations got that way). And he notes that low-tax jurisdictions became more important to global commerce as governments adopted dirigiste policies. Before World War I, governments played only a small role in economic activity, rarely taking up shares of national income in excess of 15 per cent during peacetime. After the Great War, they took upon themselves ever larger fiscal and administrative functions, notably trade restrictions and capital controls. …In a context of punitive marginal tax rates, constrained capital movements…, OFCs were vital to the revival of cross-border trade and investment after World War II. Without stable intermediary jurisdictions with robust rule of law and low taxation, much international investment would have been too costly, whether because of the associated tax burden or the risks of expropriation and inflation. Zuluaga notes that tax competition ties the hands of politicians. 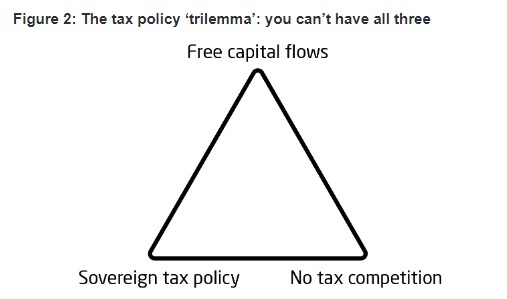 Theory and evidence suggest that countries may have any two of free capital mobility, an independent tax policy and no tax competition (Figure 2). But they cannot have all three. And here is the aforementioned Figure 2 from the report. I wrote about a version of the tax trilemma two years ago and noted that there’s only a problem if a country has high taxes. So I made the following correction. Returning to the article, Zuluaga points out that low-tax jurisdictions have a much better track record in the fight against bad behavior than high-tax nations. OFCs are neither the original source nor the ultimate destination of illegal financial flows. So long as there remain corrupt politicians, drug users and people willing to engage in terrorist acts, history suggests that some illegal financial activity will take place to make it possible. Furthermore, as we saw above, OFCs are as a rule far more compliant and transparent in their prevention of unlawful activities than onshore jurisdictions, including the United States and the United Kingdom. Zuluaga concludes with a warning about how the attack on tax havens is really an attack on globalization. And the global economy will suffer if the statists prevail. …an ominous alliance of revenue-greedy politicians, ideological campaigners and rent-seekers has emerged in recent years. Gradually, but relentlessly, they aim to dismantle the liberal financial order of which free capital movement is a fundamental component. …the alliance’s real goal: to eliminate tax competition and constrain the movement of capital in order to bring it under their control. The consequences of this effort would be long-standing and go far beyond a few tiny offshore financial centres. Excellent points. I strongly recommend reading the entire publication. Though I’m not sure Zuluaga and I agree on everything. His article notes, seemingly with approval, that offshore jurisdictions largely have agreed to help enforce the bad tax laws of onshore nations. Yet that’s a recipe for the application of more double taxation on income that is saved and invested, which he acknowledges is a bad thing. In other words, I think financial privacy is a good thing since predatory governments are less likely to misbehave if they know taxpayers have safe (and confidential) places to put their money. Now that privacy has been weakened, however, anti-tax competition folks at the OECD are openly chortling that there can be higher taxes on capital. The bottom line is that tax competition without privacy is not very effective. I wonder if Zuluaga understands and agrees. Another IEA author, Richard Teather, got that key point. In a 2005 monograph, he explained the vital role of financial privacy. Although the country of residence may theoretically impose taxes on foreign income, it can only do so practically if its tax authorities have knowledge of that income. It is therefore common for tax havens to have strong privacy laws that protect investors’ personal information from enquirers (including foreign tax authorities). The best-known of these was Switzerland, which introduced banking secrecy to protect Jewish customers from Nazi confiscation, and there remains a genuine strong feeling in many of these countries that privacy is about more than just tax avoidance. But I’m digressing. Since we’ve looked at one U.K.-based defense of low-tax jurisdictions, let’s also look at some excerpts from a column by Matthew Lynn in the London-based Spectator. He makes a very interesting point about how so-called tax havens are basically the financial equivalent of free zones for goods. …in a globalised economy, offshore finance plays an important role, enabling money to move across borders relatively easily. Rather oddly, a lot of the media seem to have decided that while it is fine for people and goods to move around the world, having a bank account or an investment in a different country makes you virtually a criminal. …The world already has an extensive network of free ports, tax-free zones where goods in transit can be processed or temporarily stored without having to pay local tariffs. There are an estimated 3,500 of them across 135 countries, facilitating the movement of goods around the world. They have helped trade grow hugely over the past couple of decades. Offshore centres…are now mainly financial ‘free ports’ — places where cash can easily be parked and transferred as it moves around the world. He also makes a very important observation about how the theft of data leading to the Panama Papers and Paradise Papers revealed very little illegal behavior. …one of the interesting things about the leaks is not how much wrongdoing they expose, but how little. Take last year’s Panama Papers scandal, for example. …For all the drama, it was pretty small beer. The reason? All the data revealed might have been interesting, and made for some lurid headlines, but very few people turned out to be breaking any laws. In only a handful of cases were taxes being evaded or money-laundered. Which is a point I’ve made as well. …it turns out that offshore centres are used by just about everyone. Most pension funds use them, including those looking after the savings of the politicians queuing up to condemn them. They are part of the infrastructure of globalisation, as much as the container ships, airports and fibre optic cables. It is ironic that many of the same people who proudly describe themselves as citizens of the world think that applies to everything except money. Amen. Once again, this is really a fight about globalization. Or, to be more accurate, a fight between good globalism and bad globalism. To wrap up, here’s the video I narrated for the Center for Freedom and Prosperity on the economic benefits of tax havens. P.S. I’ve previously cited other tax haven-related research and analysis from the United Kingdom, most notably from Allister Heath, Dan Hannan, Philip Booth, Godfrey Bloom, and Mark Field.